Since we’ve written about Disneyland, we can’t forget about Disney’s impressive little sister park next door, Disney California Adventure. It doesn’t require quite as much time to explore as the Big Mouse Trap but it’s well worth a two-day park hopper ticket price. My best advice: Go see Disneyland Park first. 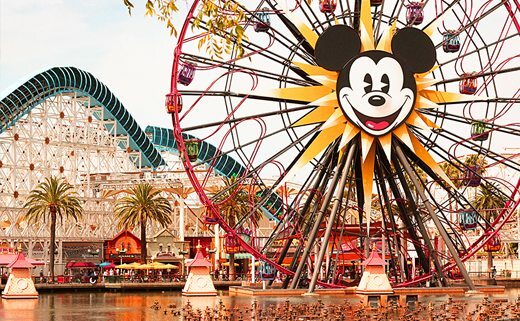 Then the next day, see Disney California Adventure. Probably by afternoon you’ll feel like you “did” the whole park, so skip back over to Disneyland to see what you missed the first day and then in the evening head back to California Adventure for the World of Color closing ceremonies. As a native Southern Californian, here are my best recommendations. Please feel free to disagree with me or add your own suggestions in the comments section. Like Disney World, Disneyland California Adventure has a main street, Buena Vista Street. Except this main street has a very distinct Southern California/Old Hollywood feel to it. 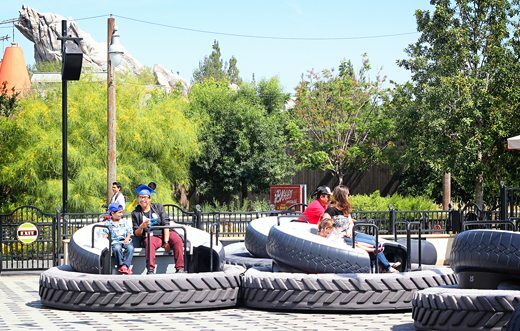 Make sure you check out the windows at Big Rock Candy Mountain and if you’re needing a drink, a friend of mine says Carthay Circle Theatre has the best “rides,” aka drinks for grown-ups. 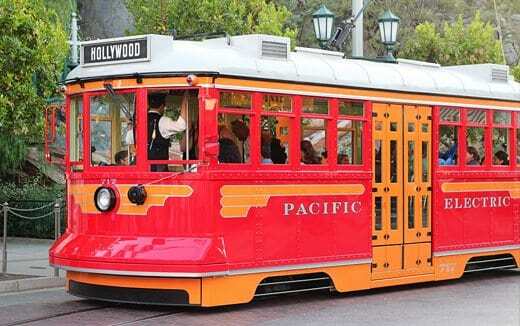 The Red Car Trolley ride only takes you from the park entrance to the Twilight Zone Tower of Terror and back but it’s fun if only for the narrating trolley drivers. If you don’t have a clue what’s going on or you’d like a little back story on the park, jump on for a stop or two. 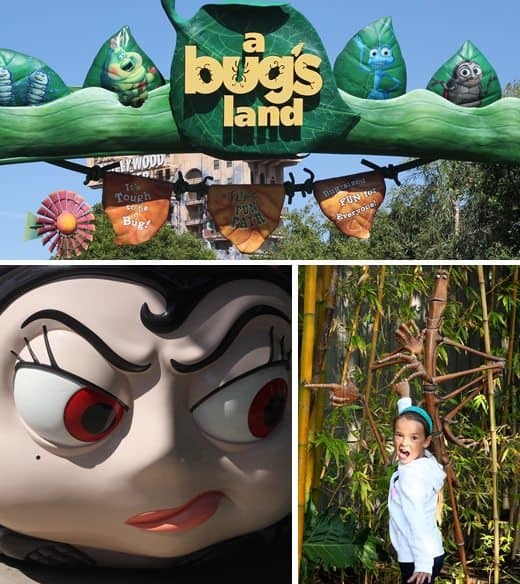 What I love about Bug’s Land (aka Flicks Fun Fair ) is that most of these rides children can go on by themselves (parents watching vigilantly from the sidelines of course). This brings a lot of pride to the “I do it myself” set. 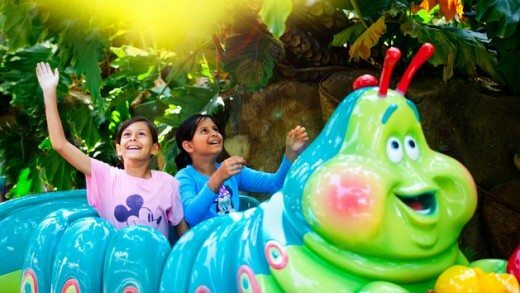 Flik’s Flyers is just another carnival ride like Dumbo’s Flying Elephants but colorful and cute. 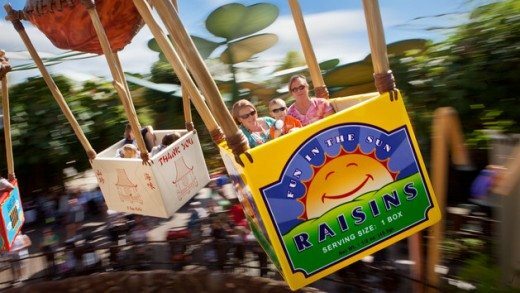 Francis’ Ladybug Boogie is basically a slower version of the Mad Tea Cups ride at Disneyland Park. But unlike the teacups, you can’t turn the center wheel to turn faster. Leaning will get you much more motion, which is not all that much. Fun for little kids. Super slow train ride but worth it for the funny narration and special scent effects. It’s Tough to be a Bug! is basically a 3-D movie with some creepy-crawly special effect surprises. Hold your little ones close if they have any major bug aversions. Visit the Princess Dot Puddle Park, especially if it’s a hot day. 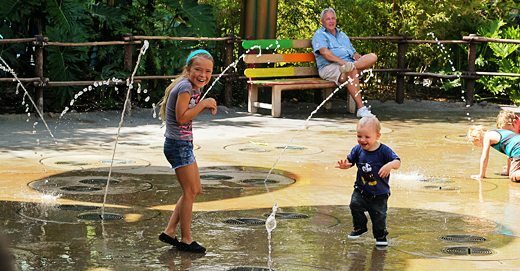 Who doesn’t love a fun drip drop fountain? Bring extra clothes to change into though. Cars are much, muuuuuuch slower than normal bumper cars. Skip this unless you are trying to kill daylight. 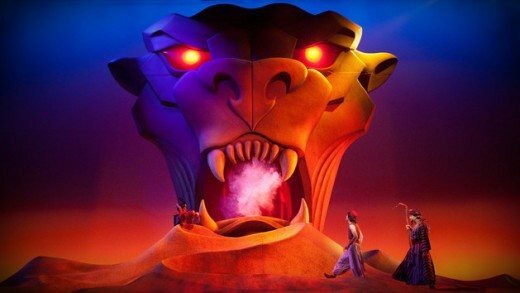 Disney’s Aladdin: A Musical Spectacular is fabulous. Hilarious. Perfect for middle of the day while it’s hot. Impressive production! Genie is always funny. Always different and current. Disney Junior: Live on Stage is good for the younger set but anyone older than four will probably want to skip it. 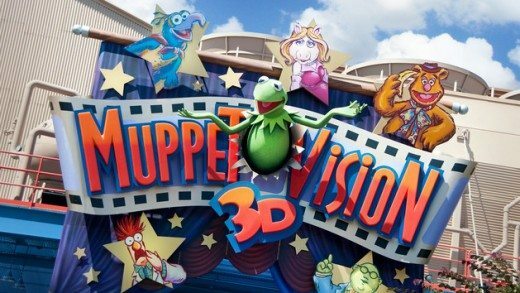 Muppet*Vision 3D is totally cute 3D movie. The new character is annoying but muppets are charming. A must if you loved the movie. If you haven’t seen Monster’s Inc. then you could probably skip it. Fun interactive bit at the end. Thrill seekers love The Tower of Terror. Make sure you Fastpass it though because lines get very long. Big drops, big thrills. Teenagers and adults will love this ride. Skip it for little ones. The Mad T Party is kind of an acid-trip, club-like scene for teenagers. Great for dancing and sporting your latest glow-in-the-dark fashion. These series of buildings are a must for anyone interested in animation. 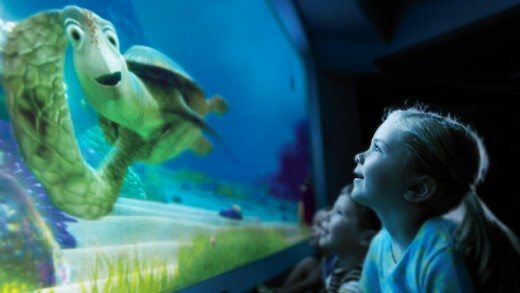 Don’t miss Turtle Talk with Crush! Great for middle of the day when you are waiting to do something else. The music alone will put you in the Disney mood. Luigi’s Flying Tires ride is surprisingly driven by air. Kind of like air hockey meets bumper cars but with way less movement. It’s not fast and you can’t really get much speed going but the novelty alone makes it fun. Added plus: listen for Tony Shalhoub (Monk) singing old Italian-American standards! Surprisingly Mater’s Junkyard Jamboree is fun carnival-type, whip-you-around ride. 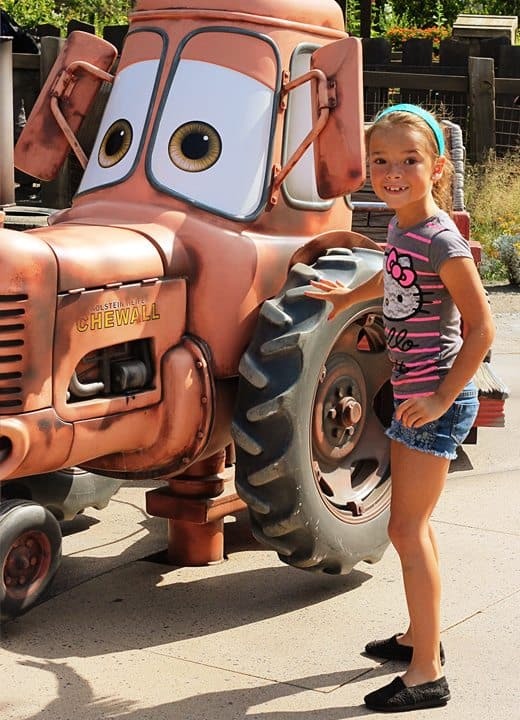 Of course Mater’s charming personality is always a win. You can’t skip this ride. Radiator Springs Racers is fun, dark and gets a good bit of speed going in the end. Get there early and Fastpass though because lines get long quick! I really thought I would say skip Soarin’ Over California because my sixteen-year-old self thought it was lame but after visiting it again after a long break, I found it fun and refreshing. A great way to cool off be literally swept off your feet. If you can ignore the dirt on the screen and forget that your are just watching a giant movie, you will feel like you really are flying. 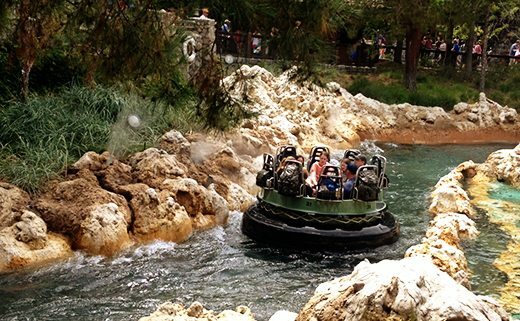 Super fun, don’t miss the Grizzly River Run! This is a white water tubing ride and there is no track. That means you really never know who is going to get wet. Pack extra clothes and store them in a locker. You also might want to Fastpass this one because it’s very popular on hot days. 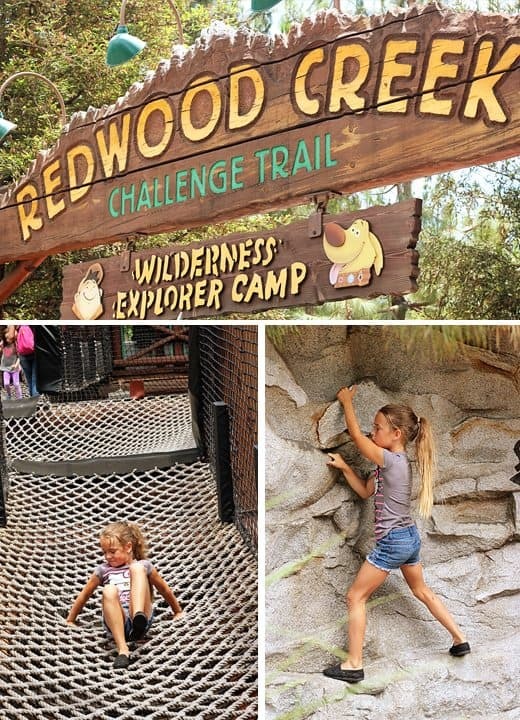 The Redwood Creek Challenge Trail and Wilderness Explorer Camp playground is a favorite for my little explorer. Lots to do and it’s just challenging enough. Tag along and get some exercise or if you feel comfortable letting your children out of sight, let them play and sit and take a breather in the faux mountain air. Plan on at least spending 20-30 minutes here. 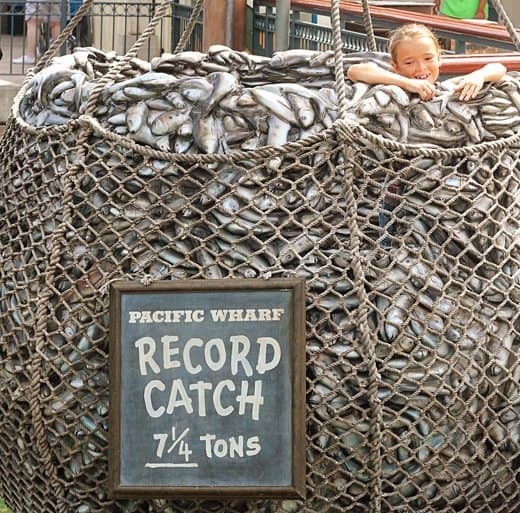 Not a lot going on in this part of the park, but it is fun to pose in the 7 1/2 Tons of fishnet near the wharf and do a little duck-watching from the pier. Skip them unless you have a hankering. It’s not called the California Screamin’ for nothing. 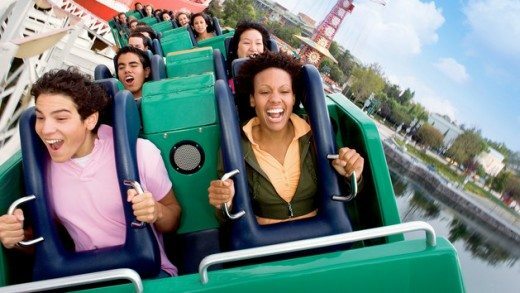 If you like roller coasters you’ll love it for the speed, drops, quick turns and best of all the length (2.5 whole minutes!) but if you don’t, you’ll hate it. Not really for kids unless they are genuine thrill seekers. I tried to force my coaster-phobic daughter to go on this ride and a Disney employee intervened and advised me not to. I figure if employees don’t even let little kids on it then maybe that’s a good measure of how fun and scary this ride really is. The Golden Zephyr is just another flying carnival ride. Pretty to look at but not much else. What can I say? The Goofy’s Sky School ride is goofy. Maybe even a goofy waste of time. I’m not a huge fan of small coasters mostly because they rattle my brains and give me whiplash but kids get a kick out of coasters that are just their size. Jumpin’ Jellyfish is nice for views but not much else. King Triton’s Carousel of the Sea is just another carousel but with sea animals so it’s kinda cute. Ariel’s Undersea Adventure is a nice slow, cool ride for little kids, telling the Ariel story but not much else. 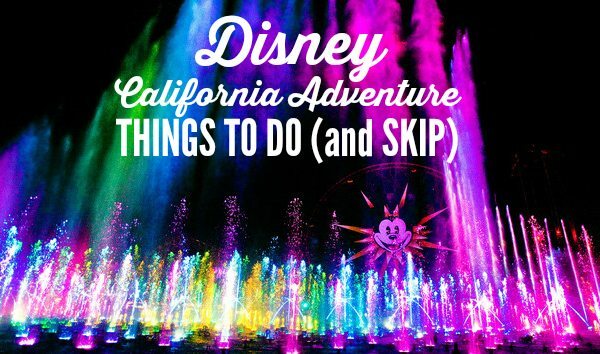 I say skip this and have lunch at Ariel’s Grotto instead. 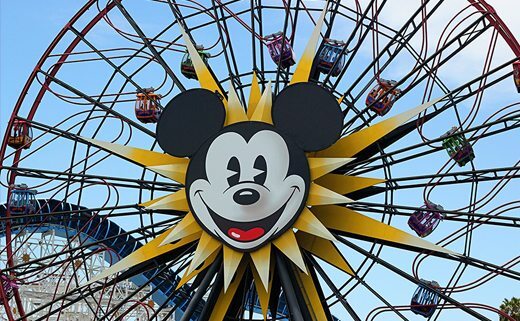 Mickey’s Fun Wheel is a must for the view! If you don’t want to get motion sickness opt for the non-swinging cars. 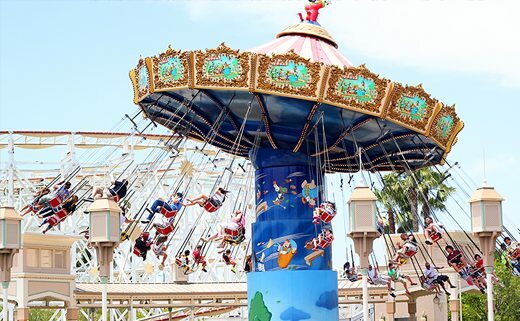 Do this the Silly Symphony Swings. Yes, it’s just another carnival ride but the views are great and there is nothing better than swinging your legs freely in the air on a beautiful Southern California day. Close your eyes and fly! 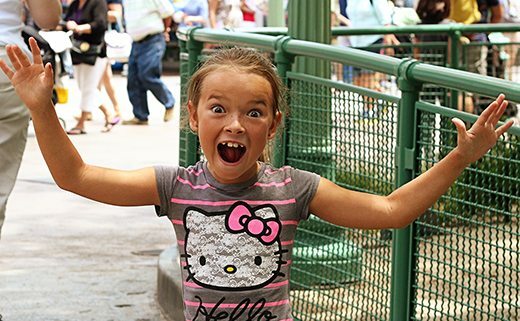 Don’t miss Toy Story Midway Mania! This crazy interactive shooting gallery is very entertaining. 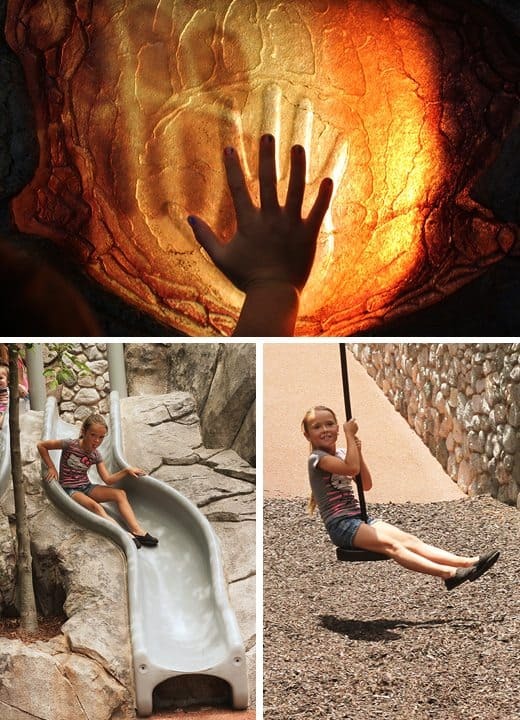 Lots of special effects and fun for all ages. The wait can be long and the waiting area can get hot so do this ride early in the morning. 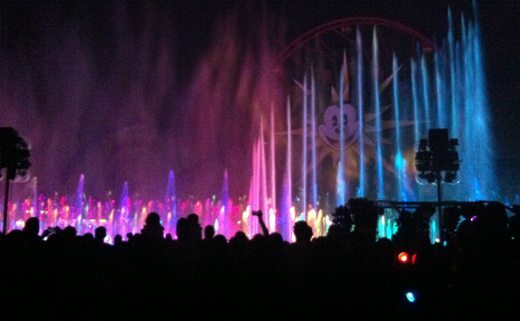 You’ll be tempted to leave early and skip the World of Color but if you have the energy, leave the park (escape for a nap in your hotel or visit some Downtown Disney shops or restaurants) and come back for this. But make sure you get a Fastpass before you leave to insure a good viewing spot. If you don’t get a good place to sit just skip it. I agree with mostly everything. I think that everybody should go on Monster’s Inc. and that Goofy’s sky school is for all age groups. I also think that animation academy is boring and that you should do Ariel’s Adventure instead. Then go to Boudin and Ghiradelli to eat and enjoy your day in California Adventure. 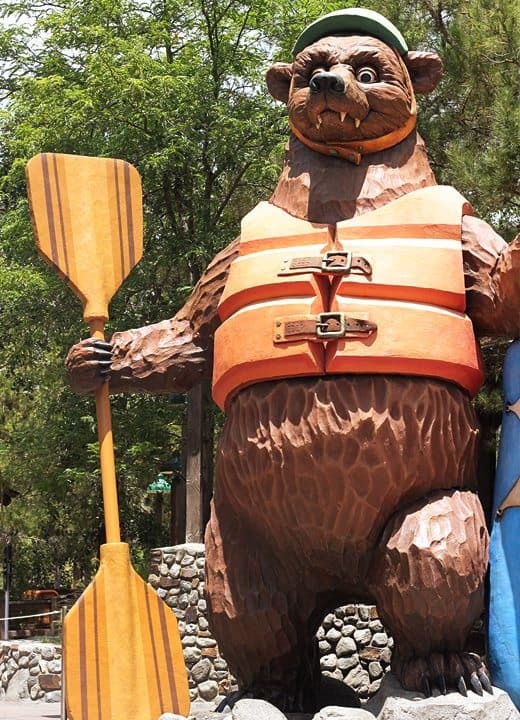 Oh, and you have to meet Duffy the Disney Bear on Paradise Pier!